He's raised millions of dollars. He says his policies are on the ballot this year. And at the last possible moment -- a week before Election Day -- President Obama will begin blitzing through blue states to campaign for a handful of candidates who say he can help, not sink, their bids for office. What a difference his six years have made -- or didn’t make, if recent polling is to be believed. The economy still feels rocky to many Americans, and the U.S. military is back in battle in Iraq. Congress works in apparent gridlock, while the president complains he’s left with his executive pen and phone, and not much else. Likely voters say they are fed up, but they’re not sure they have the power to change Washington from the voting booth. 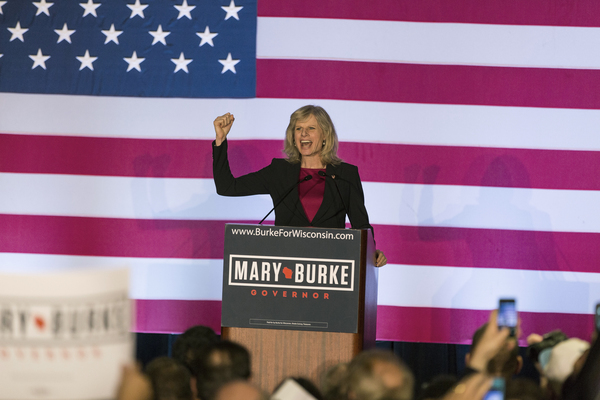 In Wisconsin, Democrat Mary Burke says she’s eager to welcome Obama to her rally at a Milwaukee high school Tuesday, hoping the president has enough star power to help her turn out voters Nov. 4 to defeat Republican Gov. Scott Walker. Michelle Obama has campaigned for Burke twice and President Clinton was in Wisconsin last week to try to boost the chances of the former Trek Bicycle Co. executive. Obama carried the Badger State by nearly seven percentage points in 2012 against Mitt Romney, and Burke for months has said she is eager to secure the president’s help to defeat Walker. The incumbent governor and his challenger remain tied heading into the final week, according to the RCP average of recent surveys. On Thursday, Obama will be in Portland, Maine, to stump for Rep. Mike Michaud, who is running nearly two points behind Republican incumbent Paul LePage in a gubernatorial contest that also includes Independent candidate Eliot Cutler, who is running third in the polls. The president’s absence in Maine -- a state that backed him two years ago by 15 points over Romney -- was noticed early this month after the first lady and Bill Clinton swept through the state. Michaud has made no bones about differing with Obama on trade and other issues. On Nov. 1 in Michigan, the president will do something unusual this midterm year: He’ll finally campaign alongside a Democratic candidate for Senate. The state is deemed friendly enough to Democrats to survive Obama’s overt enthusiasm for Rep. Gary Peters, who is running 10 points ahead of Republican Terri Lynn Land in the open contest to succeed retiring six-term Sen. Carl Levin. At the moment, Michigan’s disapproval of the job Obama is doing is close to 50 percent, while approval of the president’s performance is 46 percent. Several key Senate races this year remained on a knife’s edge heading into the final full week of campaigning, leading some pundits to predict Republicans will triumph because the GOP base is more enthusiastic this year and more likely to participate than dispirited Democrats. Democrats, poring over polls, have found little to reassure them they’ll keep control of the upper chamber. Talking points substituted for data points over the weekend. While in Michigan, a state where unemployment is more than a point higher than the national rate of 5.9 percent, Obama will also lend his support to Mark Schauer, who is challenging Republican Gov. Rick Snyder in a race that favors the incumbent by more than five points in the RCP average. Schauer’s campaign hopes the president can inspire base voters to turn out Nov. 4 and nudge swing voters, who tend to break for challengers, to fill out their ballots for the former congressman. By Nov. 2, Obama plans to head back to the East Coast to headline a rescheduled rally for Connecticut Gov. Dannel Malloy, an event postponed earlier this month when the president opted to remain at the White House to deal with Ebola infections in the United States. Obama will be appearing with Malloy after a series of tough debates helped the governor get some traction against Republican challenger Tom Foley. The latter, a private equity investor, is essentially tied with the incumbent, according to RCP, in a state where more people say they disapprove of the job Obama is doing than say they approve. Connecticut’s unemployment rate of 6.4 percent is higher than the national average, although the employment picture has brightened steadily in Connecticut since 2010. From the Constitution State, the president will fly Nov. 2 to Philadelphia to offer his support to Democrat Tom Wolf in his bid to defeat Republican Gov. Tom Corbett. Michelle Obama, Bill and Hillary Clinton have appeared separately in Pennsylvania to help Wolf, who leads Corbett by a comfortable 11 points in the RCP average. Obama’s interest in governors’ races is not merely a diversion from the Senate campaign trail, where he’s considered the skunk at the party. His help to gubernatorial candidates in blue states tracks a White House priority outlined since the beginning of the year. Dan Pfeiffer, the president’s adviser on politics and communications, has long said Democrats should devote time and resources to winning statehouses because of the importance to redistricting, Medicaid expansion, increases in state minimum wages, not to mention the ground operations a Democratic presidential nominee can tap among Democratic governors in 2016.